CHC health care workers on their way to visit a TB patient at home. Today, the clinic-based activities of the CHC and Cambodian national TB program provide care to tens of thousands of people who otherwise would have gone without. However, these efforts only address the needs of part of the population. For many rural TB patients, traveling to the clinic to collect medicine is difficult. Poor road conditions, the cost of travel, and the need to take time away from work and family responsibilities all present barriers to seeking medical help. This is particularly true for people who live on less than a dollar a day, and depend on the wages of that day's work to feed their families. Because of these factors, some people with TB get no treatment, others are not diagnosed until their disease is very severe, causing irreversible lung damage and rendering them pulmonary cripples. To address these issues, the CHC created a TB Home Care Community Treatment Model program, which began in 1999 and has benefited over 3000 patients to date. This pioneering program provides patients with daily home delivery of drugs by CHC mobile health teams during the week and uses patient supporters to ensure medication is taken on the weekend during the initial two-month intensive phase of TB therapy. At the same time, the mobile teams screen clusters of villages, going house-to-house to find people who may be suffering from TB. By doing this, TB can be diagnosed and treated earlier, before the infection has had an irreversible impact on patients' lungs and health. In Home Care Community Treatment Model areas where this active case finding has been instituted, more than 90 percent of new cases are detected. This leads to improved health outcomes for people when their disease is discovered and can be treated relatively early. At the same time, efficient detection helps limit the spread of TB, which occurs when people with untreated lung infections cough, sneeze or even talk. 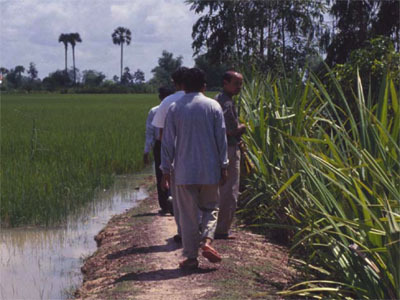 In an effort to increase accessibility for vulnerable rural populations, in 2002 the CHC developed a Community Treatment Model program in Cambodia, which trains community volunteers, sometimes former TB patients, to assist with distribution of TB medications. This program expands the reach of treatment beyond the area of mobile health teams, by training community members to help patients adhere to their medication regimen during the entire course of treatment. The CHC mobile staff provides guidance to the patient and their supporter, during all phases of treatment. The CHC Community Treatment Model initiative has been able to further increase detection, education and cure rates as well as engaging the community in controlling the spread of TB. Currently CHC manages the Community Treatment Model program for three of Cambodia's provinces: Svay Rieng, Kompot, and Kandal, and the CHC-inspired Community Treatment Model program to cover the entire country is underway led by the National TB Program. In Kompot and Svay Rieng provinces, CHC covers a catchment area of approximately 998,452 people, while in Kandal province a population of 1,242,507 is covered, which includes 90 health centers and 1083 villages.